On a Wednesday afternoon in March, the rain in Bariloche subsides. As the sun makes its first appearance that week, my best friend Laurel and I fill our backcountry packs with a tent, sleeping bags, sleeping pads and food and head out for a 24-hour adventure in the mountains that run the length of this Argentine town in northern Patagonia. We’re giddy; happy to be spending time off-the-grid together. The last time we embarked on a backcountry camping trip, I was living in Jackson, Wyoming. That was six years ago. We were fresh out of college and had little-to-no idea what we were doing. I often laugh at just how much gear we took with us for only one night. Now, Laurel is visiting me here in Bariloche, my home of the last 10 months, and today, we’re venturing up to Refugio Frey, one of Bariloche’s backcountry gems. We catch the local bus to Cerro Catedral, and within minutes, we’re en route to Frey, a mountain hut that’s only accessible via foot. We trek along in sync, chatting and marveling at the views of Bariloche, Lago Gutierrez and northern Patagonia’s peaks—some of which are now snow-capped following two days of rain. We pass two Argentine men, also headed to Frey, and after that, the trail is ours. For the most part, the trek to Frey is mellow. Around 5:00, we climb the final ascent and arrive at the refugio. Frey lies on the edge of a small lake and is surrounded by a jagged line of granite spires—a popular spot among climbers for its wealth of routes. During the winter, it also boasts adventures in skating and skiing. Laurel and I leave our packs outside, pull open the heavy door and step into the modest refugio. For me, the charm is in the details—both the details that stay and the details that come and go daily. On busier days, backpacks, hiking poles, boots and sleeping pads hang out in messy piles by the door. Trekkers, both Argentines and foreigners, cozy up on long benches around wooden tables. Talking. Playing games. Snacking. Studying maps. Sipping, refilling and passing mate, a hot herbal beverage, traditional in Argentina, that’s drunk from a hollowed-out gourd using a straw called a bombilla. In the refugios, it’s often hard to discern who’s been friends for years from who’s only met that day. 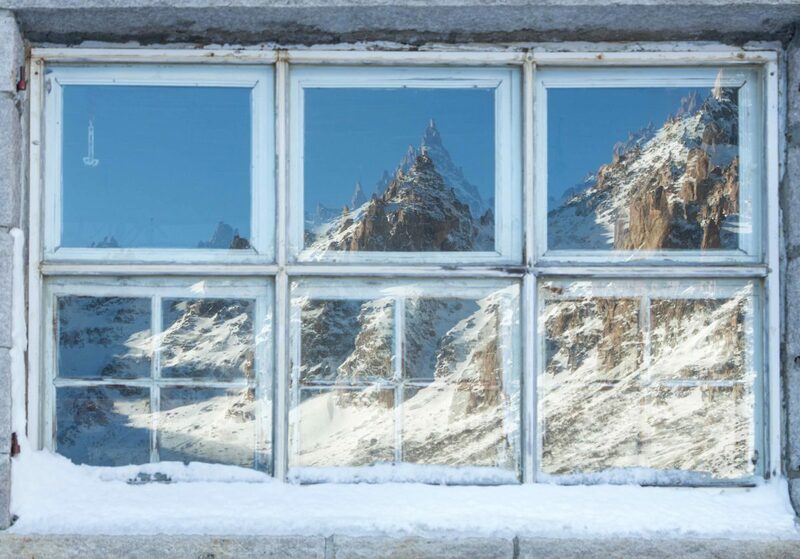 Today, however—a mid-week day in autumn—the refugio is quiet. A refugiero greets us, asks a few questions and gives a quick rundown. Camping is free, so we scribble our names on a log sheet and head back outside to set up camp. 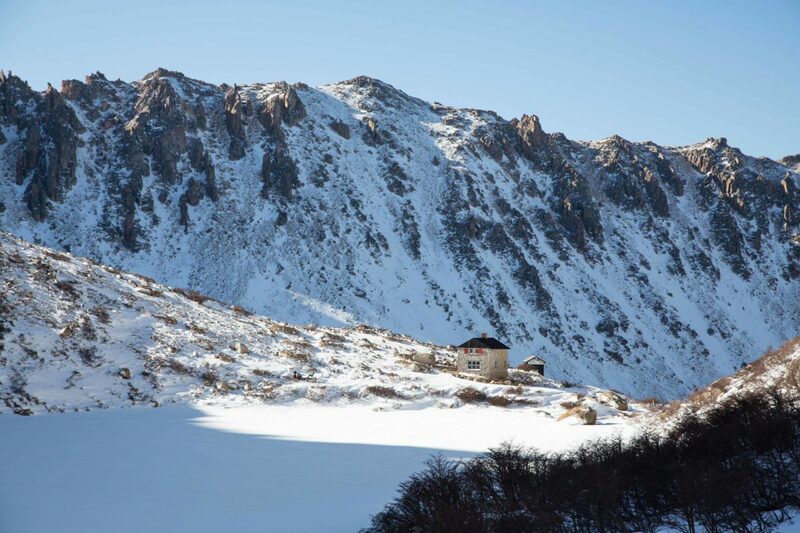 We find a spot tucked into the side of the mountain below the refugio, set up our tent, take in the sweeping scenery that surrounds us and return to the refugio’s warm interior. We settle into a corner between two windows. Photos and maps with curled, crinkled edges adorn the walls. Socks and shoes dry by a wood-burning stove. 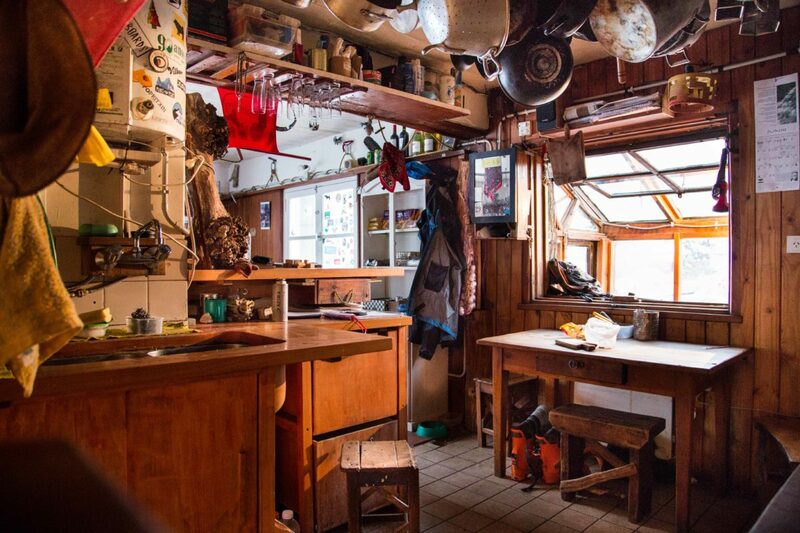 A plethora of knick-knacks hang from the walls and the ceiling—an ode to alpine adventures and stories of days gone by. We’re joined by an Argentine couple from Buenos Aires—they’re camping as well—and before long, the two Argentine men we passed on the trail have also arrived. That night, it’s just the six of us and two refugieros. Throughout the afternoon and into the evening, we sit, chat and pass mate. As we talk, my eyes move between Laurel, our new friends and the views that lie beyond the weathered windows: the lake and those majestic, mesmerizing granite spires. The peaks surrounding Frey form one of the more distinct ridgelines in Patagonia—and the world. No matter how much you study their patterns and movement, it’s tough to peel your eyes and adventurous imagination away. The sunlight fades to dark. A few lights flicker on, elevating the warm atmosphere. Laurel and I share a mushroom pizza and bottle of wine followed by some chocolate. We pull Cards Against Humanity from a shelf. The conversation turns to English and we teach our new Argentine friends how to play—somewhat successfully. Around 10:00, we call it a night, bundle up and walk out to our tent, taking in the magnitude of stars that speckle the southern sky. There’s a certain calm and simpler pace of life that exists in Bariloche as a whole, especially up in the mountains. Taking the time to disconnect from the world as I know it and connect with myself, others and nature centers me in ways most things cannot. Tonight, with my first backcountry adventure buddy by my side, I slide into my sleeping bag, read for a bit and fall asleep to a still, silent Patagonia night. If you can, visit the refugios in the shoulder seasons. Summer brings a swarm of people, both Argentines and foreigners, to Bariloche and the refugios. Refugio Frey is open year-round. For all the refugios, barilocheturismo.gob.ar or Club Andino de Bariloche provide helpful guides. If you’re planning to go in the spring, winter or autumn, check trail conditions—as you could end up hiking through snow. My suggestion here varies based on which refugio you’re going to. It’s often possible to take a local bus to the trailhead. You’ll want to check timetables and locations. You can also take a taxi or a remis, or if you have a car, you can drive. You can reserve a space inside the refugios for a fee or camp outside the refugios, with your own camping gear, for free. If you opt to stay inside, a bed is provided, but you will need your own sleeping bag. The refugios have kitchens that you’re able to use for a fee. You can also order food, anything from snacks to pizza to the meal of the day. Prices are typically listed online for each refugio, so you can plan before you go. The refugios have beer, wine and other beverages for purchase. Embrace the warm, friendly atmosphere: strike up conversation—in Spanish, English or perhaps another language—with others. It’s the best way to meet locals and other travelers and get to know more about the region. Share a mate. Drink some wine. Play a game or two. Study the photos, maps and knick-knacks that adorn the walls. For me, the true charm of the refugios is when you walk through the door, especially after a long day of activity, take a seat on a wooden bench and experience the warm atmosphere far into the evening—when nature’s light dims and candles are lit. About the author: Emily Hopcian’s hunger for travel, outdoor adventure and new challenges landed her in Bariloche, Argentina, where she lives and works as a writer and story strategist. A Michigander at heart, Emily is happiest playing in water, exploring the backcountry and embarking on road trips. Her writing can be found at emilyhopcian.com. Follow her on Instagram @emilyhopcian.